This 2 foot turkey leg makes a BIG statement! Turkey Bat and Ball Game, anyone? Award the biggest ''TURKEY'' at any sports banquet or corporate awards night, your next Ren-Faire or family Turkey Bowl! Approx. 24-inch (60cm) long, x 9-inch (22.5cm) across at the widest. Hysterical artificial costume accessory for Henry the 8th renaissance costume, Thanksgiving decoration, Christmas gag gift, joke, prank, pretend play, theater stage prop, photo or store display! 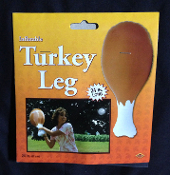 A hilarious table centerpiece... your family is sure to have some great laughs... or burn off the calories with an invigorating game of Turkey Ball! Big faux food soft PVC Vinyl Blow-up Turkey Leg. Autumn Fall scene or theatrical prop building supply accessory. Funny Thanksgiving Bird costume accessory. Funny labeled with a ''Please EAT HAM'' or ''EAT More BEEF'' sticker or sign! New in manufacturer package, by Beistle. *NOT a TOY - Not intended for use in play by children under 3 years of age.